Compare these two approaches to improving the quality of teaching and learning and the value of higher education (click on images; both were published in June 2013). It is an interesting contrast between conventional thinking about a problem (left) compared and Lean thinking about the same problem (right). 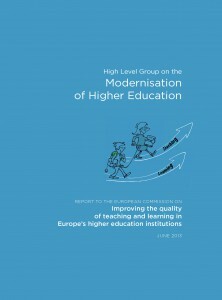 The fundamental problem is stated on page 4 of the Modernisation of Higher Education report to the European Commission: “…the quality of teaching in our universities and colleges is often overlooked and undervalued.” The report associates quality teaching (“the best teaching”) with students’ ability to think critically and do research. In contrast, I defined quality teaching as a reduction (or elimination) of common teaching errors, in addition to teaching in ways that develop students’ critical thinking and research skills. The report holds all parties accountable for this situation: government agencies, the leaders of HE institutions, faculty, etc. While it includes many useful suggestions for teachers on how they can improve teaching, the report does not sufficiently examine the cause of why teaching is often overlooked and undervalued – and, specifically, the role of generations of leaders in helping to create this outcome. It also fails to identify the specific processes that lead to teaching becoming systematically overlooked and undervalued (e.g. [lack of] management review, department meetings*, student feedback, annual faculty evaluation, tenure, etc.). The report to the EC recommends a more balanced emphasis on teaching and research, recognition for innovative teaching and learning methodologies, and top management support for developing teaching skills. They seek professionalization of teaching in HE as the principal means to assure quality, though professionalization does not guarantee quality, and, while it may satisfy critics, professionalizing teaching may not address the root cause of the problem. In addition, professionalization usually leads to higher labor costs. Click here to access the full EU report (81 pages). * Perhaps the standing agenda for department meetings should be the four categories on which faculty are evaluated: Teaching, Research, Service to the University, and Service to the Profession. Doing this would help bring teaching, the sharing of teaching methods, and student feedback to the forefront on at least a monthly basis.